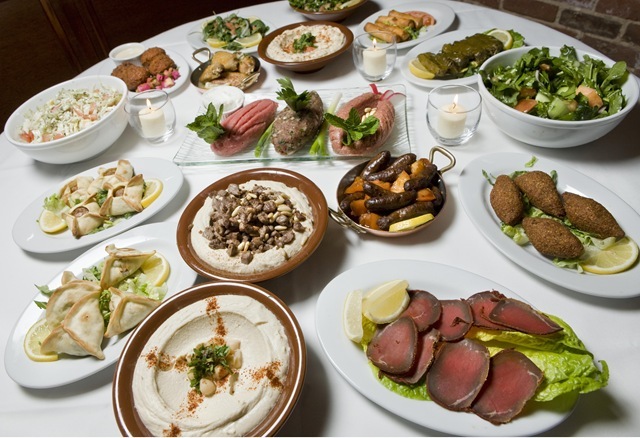 Al Bustan became THE place to find the most elegant Lebanese cuisine. While the original closed last December it was due to Owner and Executive Chef Elias Ghafary wanting to expand his brand into an even larger and more beautiful space. 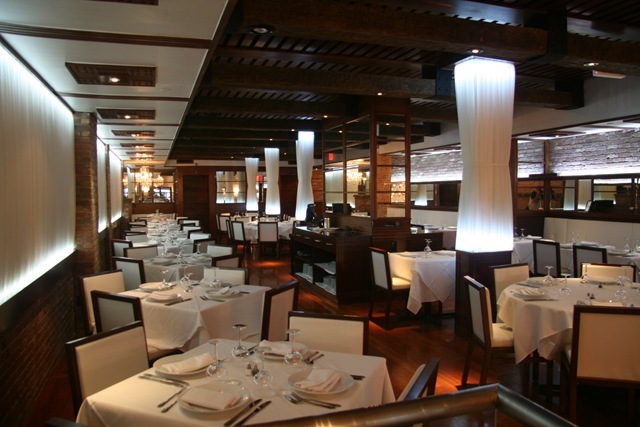 Thankfully for neighbors who have grown accustomed to their presence in the area, Ghafary found a gorgeous two-level space nearby and has reestablished the Al Bustan name back into Manhattan’s culinary landscape. The restaurant recently softly opened to neighbors and passer bys and has now proudly reopened just in time for 2010. After serving a limited menu without a liquor license during the holidays, they are now open to the public 7 days a week for lunch and dinner and as luck would have it, the license came in just in time to allow them to officially open the first week of the new year. Gant wood ceiling beams, brick walls of red, white and stucco, pillars coverd in white organdy, lit internally, three chandaliers, one massive one leading down to a party room. Shibny hard wood floors, spacxious witgh white clocths,. wine Ksara 2006 ($36), Bordeaux blend. Turenips, julienned, marined 48 hours in in vinegar, salt, garlic & beet juice. Award-winning website, Punchin-dot-com, features the Walman Report and reviews of restaurants, travel, wine and theater. For roughly 20 years, the name Al Bustan (OWL boo-STAN) went hand in hand with authentic Lebanese food and warm Lebanese hospitality. Now, in its spacious and elegant new location, with its crystal chandeliers and working fireplaces, it is better than ever. And thanks to Owner and Executive Chef Elias (ah-LEE-us), service is some of the most solicitous in town. Although there is a full bar and generous cocktails, try the milk, licorice flavored Arak (R-ack) with the stars of any Lebanese restaurant , Meza (MESS-ah), wonderful hot and cold appetizers, designed to be shared, including smoky whipped eggplant or chickpeas, divine stuffed grape-leafs, lamb tartar with pine nuts light as air falafel (fa-LAH-ful). Four people can order a choice of 18 of these luscious treats, and yummy Lebanese desserts for about $45 person. 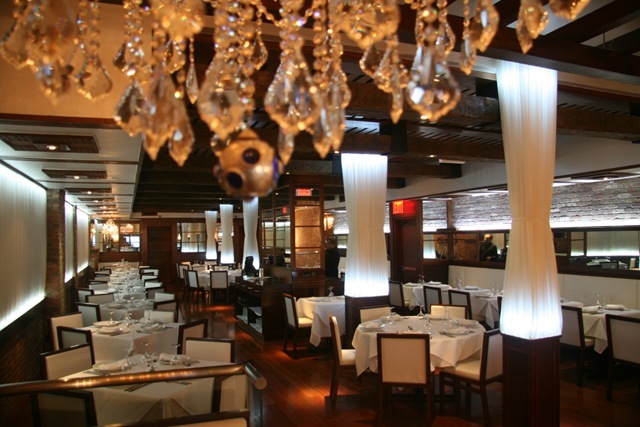 Try the terrific Lebanese wine, Kssara, for $35 and you’ll agree: In the Lebanese league, Al Bustan, 319 East 53rd Street (Between 2nd & 3rd Avenues) is a s good as it gets. For a free subscription to “The Walman Report,” visit www dot Punchin dot com on the net. (Please Spell Out) That’s p.u.n.c.h.i.n dot com. Ghafary has been with Al Bustan since the beginning and can actually take credit for introducing New York City to high end Lebanese food a couple of decades ago. With a pedigree from France and having been #1 in his class at the Culinary School of Beirut, Ghafary is an expert on this bountiful cuisine and loves inviting people in to his “home” every night for some traditional Lebanese food such as Mouhamara, walnut, red pepper, garlic, chili pepper and pomegranate molasses; Tabbouleh, parsley, tomato, onion and cracked wheat; and Moussakaa, eggplant simmered with tomato, garlic, onion and olive oil, as well as some unique dishes he has brought to this new location including Kibbeh Lakteen bill Saniya, baked pumpkin and cracked wheat stuffed with spinach and chickpea; Zaatar Salad, fresh wild oregano, onion, lemon juice and olive oil; and Kibbeh Samak Nayeh, tuna tartare blended with jalapeno and onion. 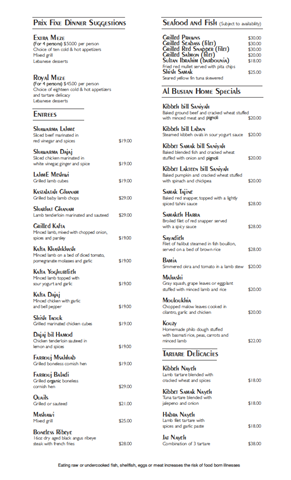 Other outstanding offerings include Labmeh, Foul Medamas, as well as elegant entrees such as Halibut. Heralded as the most popular of all the Middle Eastern cuisines, Lebanese fare traditionally consists of fresh vegetables and fruits, poultry, seafood and lamb, the essential flat pita bread that also substitutes as a fork in this culture, and an array of Mediterranean elements such as garlic, lemon, olive oil, cilantro, tomato sauce, among others. This is reflected throughout the menu at Al Bustan in main dishes such as Ghafary’s favorite Samak Tajine, a whole baked fish, usually Red Snapper, topped with a lightly spiced tahini sauce and pine nuts; Kibbeh Lakteen bill Saniyah, baked pumpkin and cracked wheat stuffed with spinach and chickpea; and Habra Nayeh, a lamb filet tartare with spices and garlic paste. Some truly unusual dishes served here include Zaatar Salad, with wild fresh oregano, onion, lemon juice and olive oil; Silek Mahshi, Swiss chard leaves stuffed with rice, tomato, chickpea and lemon; and Chankleesh, spicy cheese, onion and tomato. 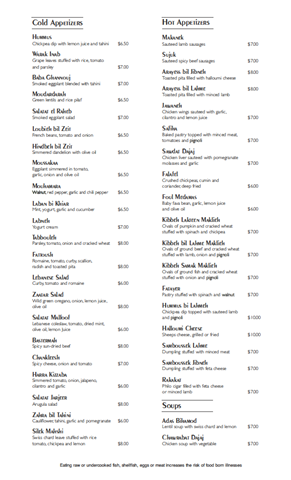 An assortment of traditional small plates, or Mezze, include Baba Ghannoui, smoked eggplant blended with tahini; Mouhammara, a puree of walnut, red pepper, garlic, cucumber and pomegranate molasses; Tabbouleh, parsley, tomato, onion and cracked wheat; Sujuk, sautéed spicy beef sausages; or Arayess bil Jibneh, toasted pita filled with halloumi cheese. Aromatic non-alcoholic drinks are a perfect way to start off any meal and will add tranquility to your experience. The Tamarind is a simple concoction of Tamarind syrup and water, while the Jellab is a perfumed drink scented by rose water, incense, carib molasses and floated with pine nuts. The wine list consists mainly of bottles from France, Spain and of course Lebanon, home to the first Middle Eastern winery, Ksara, which was built in 1857. 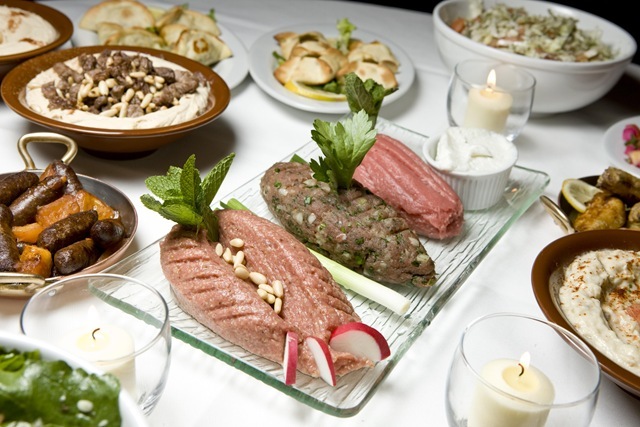 While Lebanese cuisine had made successful crossovers to cities including London and Paris, it wasn’t until Ghafary came to the US in 1988 and established himself as a restaurateur that this city finally came to know what true refined Lebanese cuisine meant. For this reincarnation Ghafary, the original owner and founder, has carried over some of the original staff such as Chef de Cuisine Refaat Husseini, and has teamed up with new team members including partner, Norman Hobeika, a long stand small business owner who has launched several Lebanese fast food restaurant across the Tri-State area, and part owner Paul Hobeika. Al Bustan means "The Orchard" in Arabic. Al Bustan offers more than three dozen meze or small plates.entrees offer everything from classic lam shawarma to grilled kafta. This entry was posted on January 20, 2010 at 10:08 pm and is filed under Uncategorized. You can follow any responses to this entry through the RSS 2.0 feed. Responses are currently closed, but you can trackback from your own site.